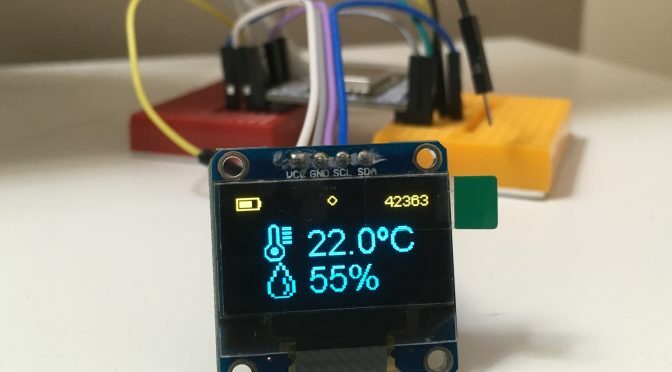 My first project will be a Temperature and Humidity sensor wired to an ESP8266 12-F with a OLED screen to show the data. ESP8266 microcontroller apart from show the sensor values on the screen, it will send these values through MQTT to my OpenHAB server (Raspberry Pi powered) in order to integrate in my current home scene. I had problems ans spent a lot of time with the bitmap conversion. My first attempt was failes because of I wasn’t generating the hex code correctly. I converted my BMP through this site: http://www.digole.com/tools/PicturetoC_Hex_converter.php or with the powerful LCDAssistant, but I made the mistake of paste the result directly in my Arduino sketch… It seems that isn’t enough… The bit order was not correct. Following this change of approach, the bitmaps that I wanted to show, finally were painted correctly!